One of the things I love about the Dutch is the delight they take in flowers. Since we arrived in March, there has been a temporal cavalcade of blooms, beginning with daffodils, and cycling through the famous tulips in every conceivable color and shape, and then irises, wisteria, poppies, foxgloves, roses, and various others whose names I don’t even know. Flowers bloom in abundance on canal railings, in tiny niches of earth on city streets, on balconies, and in a wild profusion in tiny front gardens. To say nothing of the city parks, which are a pleasant mixture of hidden playgrounds, beautiful shade trees, walking paths dotted with romantic benches and picturesque bridges, the occasional cafe with indoor and outdoor seating, and little patches of formal and botanical gardens. 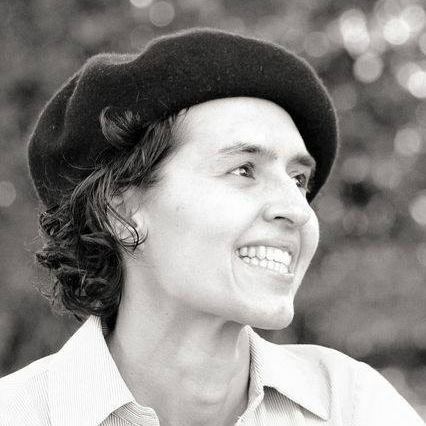 In fact, I was speaking a few months ago with a master’s student in ecology. He said The Netherlands was a very difficult place to find natural ecosystems, because the Dutch cannot seem to restrain themselves from planting flowers even in “natural” areas. 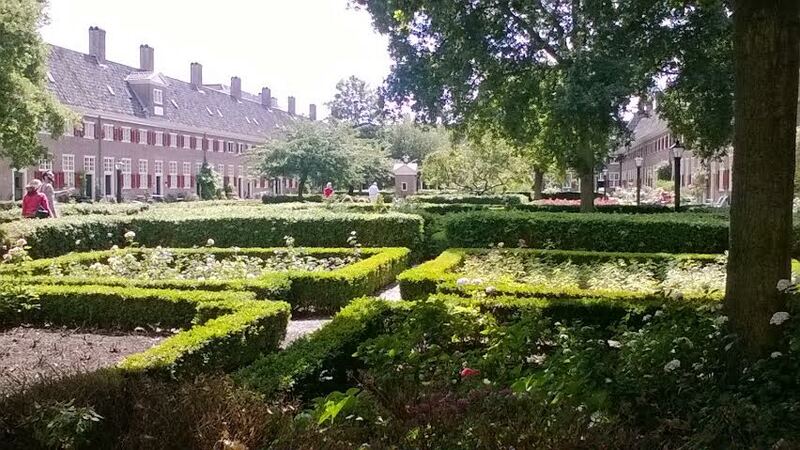 Which leads me to the topic of this post: the hofjes, or little gardens of The Hague. 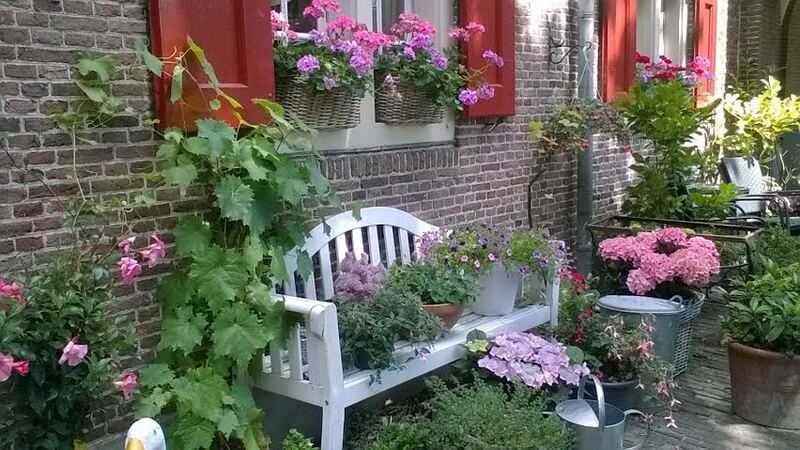 Hofjes are hidden courtyard gardens, usually surrounded by (tiny, adorable) houses for elderly women. They date back to the Middle Ages, and originally served as a form of social housing. In fact, that’s still the function most of them serve, and the gender and age requirements have remained intact. 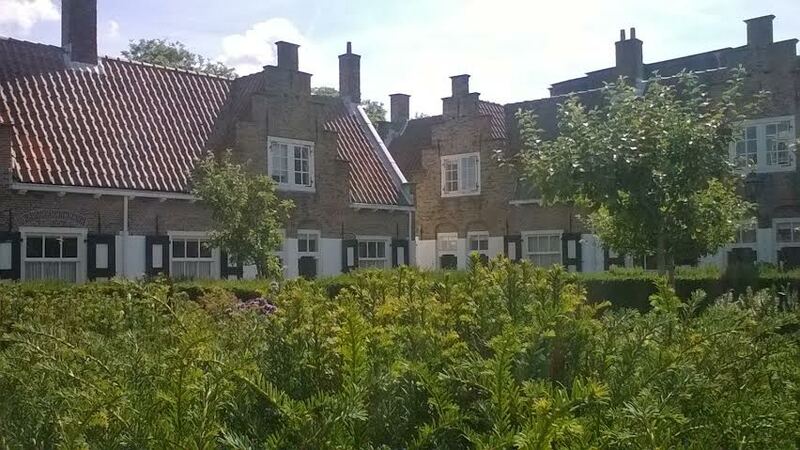 As part of my new job, I was invited to go on a tour of the hofjes in The Hague last week. Obviously, I’ll be writing an entire post about my new job one day soon, but suffice it to say here that we utilize a lot of volunteers. And since we can’t provide them with financial compensation for their time, we tend to pay them in tours and chocolate. Thursday’s tour began not far from the Binnenhof, which just happens to be the oldest house of Parliament in the world still in use. 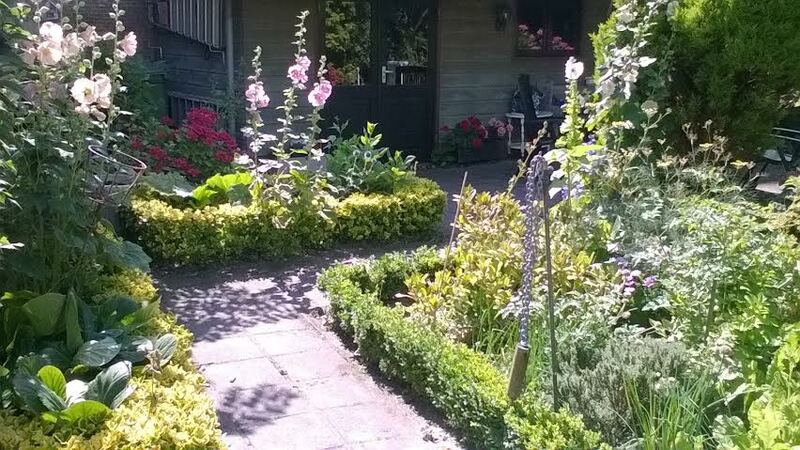 You can see what I mean about the ubiquitous flowers (in these case more perennial geraniums). 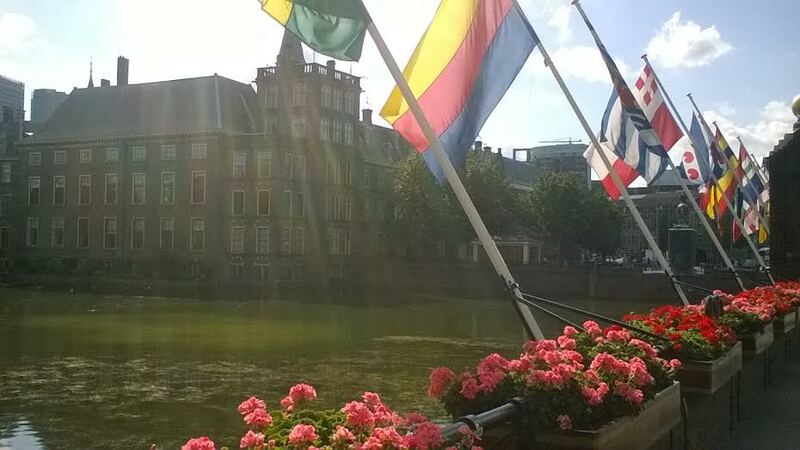 The flags represent all the different provinces of The Netherlands. Our first hofjes looked like this from the outside. 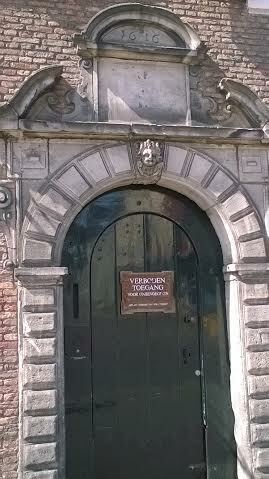 Over the door you can see the date it was founded (1616). The sign on the door says “access forbidden,” or in other words, no trespassing. Most of the hofjes are private, and you would never know they existed from the outside. Inside, though, it’s like stepping into a tiny oasis of calm (and horticultural obsession). You can see the quaint little houses that surround the garden. Each one has just a tiny kitchen and sitting area on the ground floor, and then a bedroom and bathroom above. In the early part of the 19th century, the hofje was in danger of being torn down because there was no indoor plumbing, just eight bathrooms (two in each corner of the courtyard). Fortunately it was saved, and now each house has normal plumbing. There is, we were informed, one man who has been allowed to live there–the male half of the caretaker couple, who does the gardening. I think he earns his keep. 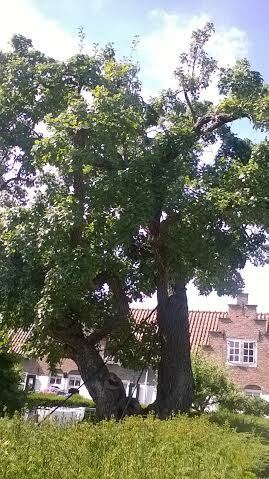 Our guide told us that the pear tree in the middle of the garden is as old as the hofje itself. He may have been exaggerating a tiny bit, but it did look quite ancient, and is being held up by several well-placed cables. It still, however, bears pears. I won’t show you photographs of every hofje we visited, since there were quite a few, and by the end my feet were properly tired, like I had been walking around sightseeing all morning. Our tour guide was the height of an average Dutch man, which is to say practically a giant. He had correspondingly long legs, and was forever having to wait at street corners for us to catch up. My favorite garden was one that had two separate mini-courtyards. Here’s the entry courtyard, laid out with what I thought was an extremely tasteful balance of color, shape, and space. Did you notice the interesting object in the middle? It looked to me like some sort of nautical navigation instrument, but was probably just a pretty sculpture. 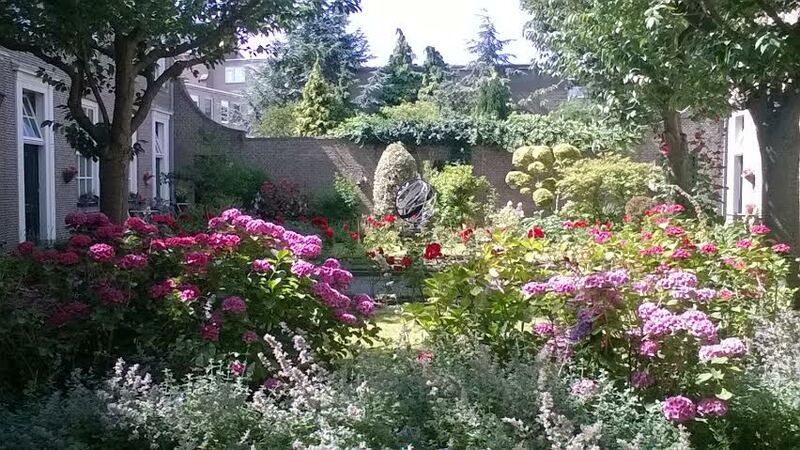 Here’s a bit of a close-up, which also shows the lovely rose-lined pathway in the middle of the garden. Something I noticed here and in Italy as well is the extreme attention to detail. I think it’s something that comes partially from having very limited space. Every square meter in the garden has to count, whether it’s on the ground or up the wall. 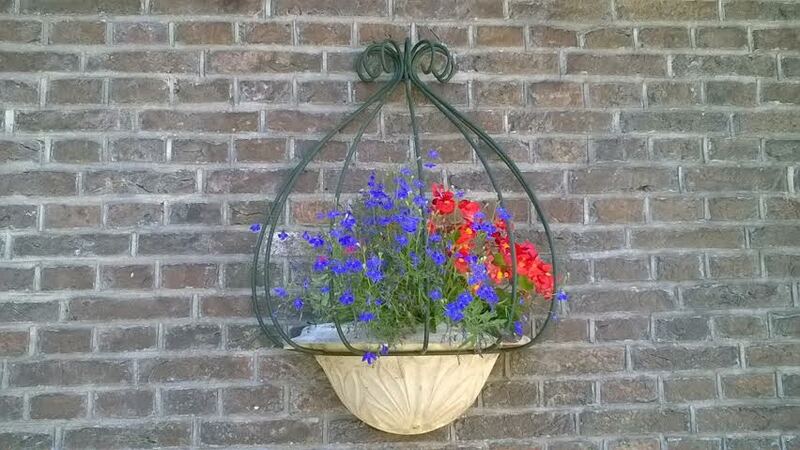 Here’s a little plant hanger on the wall, which stands out beautifully against the bricks. Through a little archway was another, smaller garden, all abloom with hollyhocks and hydrangeas and a great mass of sweet peas climbing the wall. I think Dutch horticulture strikes a lovely balance between wild abandon and cultured formality. Everything is very much artfully placed, but the effect doesn’t seem artificial. One imagines that this is exactly how the flowers would have chosen to grow, had they been allowed to decide for themselves. Or perhaps all these floral extravagances were just poetically turning my head. The final garden we visited is a more modern one, and lacks the social welfare component. Anyone can live here, provided they can pay the rent, which I imagine is somewhat prohibitive. It’s far larger than any of the other hofjes we visited, and what it lacks in charm and intimacy it makes up for in breadth and drama. I think this photo gives the best impression of the sheer size of the courtyard. Each of the gardens had different rules about where visitors (who normally weren’t allowed at all, so rules within rules) could go. Here, the rule was that we could walk to that tiny brick shed in the middle, which marks the halfway point of the garden. This garden was on a grand scale, but the little details were still very much in evidence. In fact, the residents got into the spirit of things. Here’s the area right outside someone’s front door, decorated personally by the tenant. 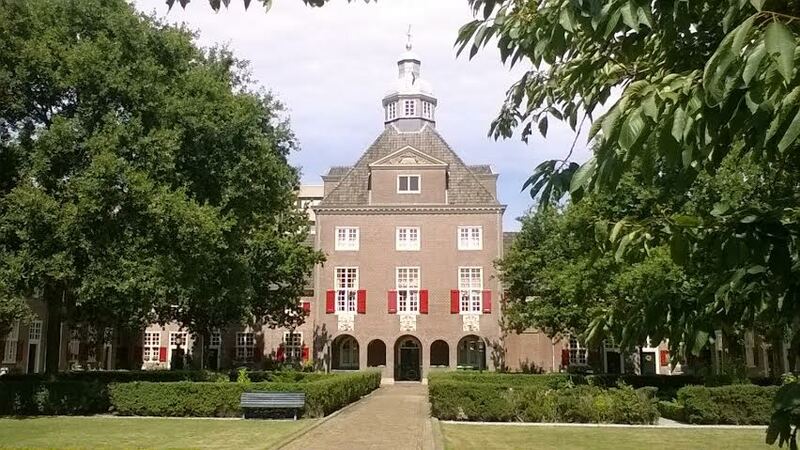 Even the administration building presided over this large-scale hofje with an air of grand authority, although it still follows the general style of all the hofjes with its brick walls and those ubiquitously charming red shutters. 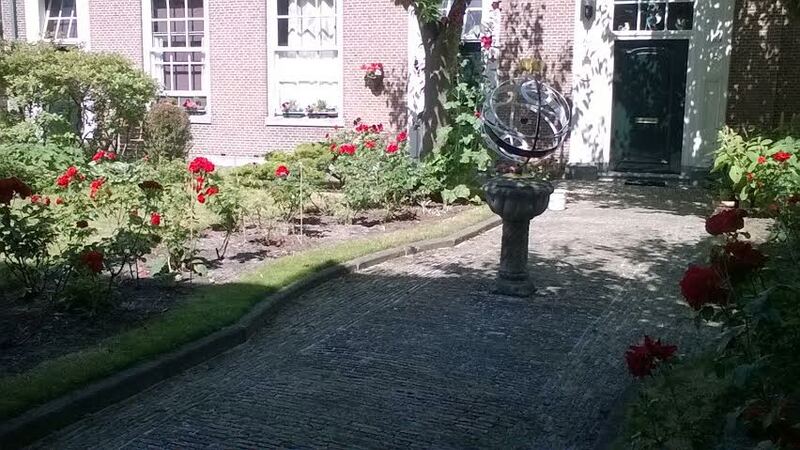 And I hope you’ve enjoyed this little vicarious tour of the hofjes of The Hague. I didn’t manage to include everything, so if you want to know about Spinoza’s house or “Keep an Eye on It” Street, or the building with the faces of conspirators carved on it, then you’ll need to visit The Hague yourself (and visit me too). I’m actually impressed with myself for how many of the details I recalled. As well as with the fact that I remembered to take almost all my photographs in landscape orientation, since they’re so much more bloggable then. I didn’t have to crop a single one. And that’s all! Good night, friends, and may you dream of flowers. Gorgeous! Keep the posts coming, please! I would be in heaven. Now I have to go!